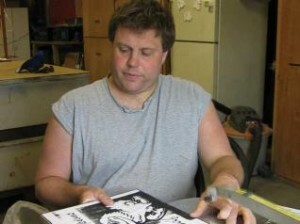 Erik Warren works on a scroll saw project. Despite having autistim, Erik has his own scrolling business. When the Warrens discovered that both of their sons were significantly handicapped, they became all the more determined to give them lots of love and help them reach their fullest potentials. Th ey have succeeded on both counts. 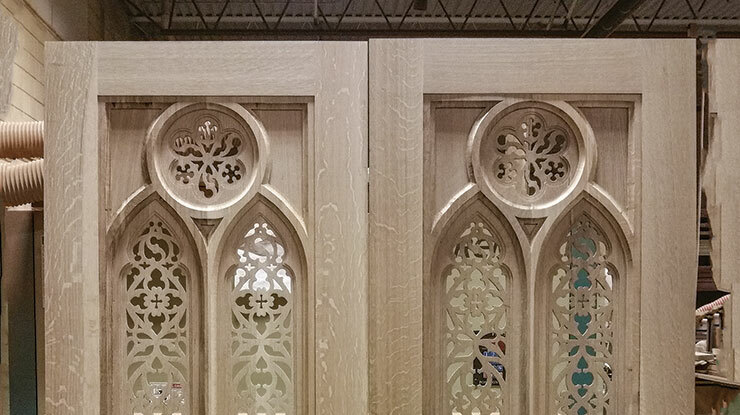 Today, 36-year-old Erik (with autism) and 39-year-old Jason (with Williams Syndrome, a rare genetic disorder) each work in a scroll saw-related business. These businesses not only keep the boys happy, but they help ensure a productive life for them, should anything happen to Jim Warren, their dedicated father. “It’s amazing to me how these kids are like night and day,” said Jim Warren. 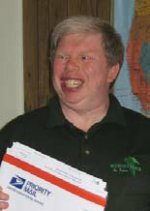 “Jason is very social and musically talented.” He exhibits intellectual strengths and weaknesses typical of individuals with Williams Syndrome. “Erik is physically capable, but socially inept with very limited verbal skills; ‘scroll saw’ and ‘pizza’ are among his understandable words. Yet, they are both a joy and an inspiration to me every single day,” Jim continued. 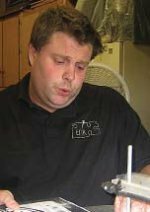 When Erik was in his late teens, a special education teacher got him involved in a woodworking project that required the use of a scroll saw. Erik enjoyed it so much that Jim bought him his own scroll saw, and they learned how to use it together. To everyone’s surprise, Erik took to the scroll saw like a duck to water, so Jim set him up with a little shop of his own. Since then, he has produced a myriad of high-quality sports, spiritual, and nature-themed artwork for his business, aptly named Erik OriginalsTM. All Erik Originals are hand cut by Erik before going on to the finishing crew. Erik uses a Hawk scroll saw with a #2 reversetooth blade. Most of his framed work is cut in 1/8″-thick Baltic birch plywood, although some of his work is cut in ¾”-thick aromatic cedar. In addition to his array of patterns, Erik also does some custom work. The budding artist began selling his work 15 years ago through retailers that Jim was able to convince to display Erik’s work. Now he also sells his work online through his website. Last year alone Erik sold well over 1,000 pieces. According to his father, most people who see Erik’s work love it and are impressed with the quality. Those admirers often have no idea that Erik has autism. For Erik, his unique gift is an effective way to help him deal with his compulsions. “We hide wood from him, because if he sees it, he’s got to make something with it–then there’s no stopping him. He has been known to work up to 23 hours straight, but he has gotten much better at controlling that urge. He sets his own pace for what he wants to do each day. Then anything he leaves to do for the next day, he’ll carry home and take it to his bedroom with him, because he doesn’t want anyone doing his work. An entrepreneur himself, Jim Warren currently owns an asphalt maintenance company in Hays, KS. Over the years, he has jump-started several other businesses. Within the past year, Jim established a company for Jason to work in, called Wonderpaper by JasonTM. It was born out of Erik’s scroll-sawing business. After years of helping Erik glue patterns onto his wood pieces, Jim stumbled onto some large sheets of self-adhesive paper. He cut the paper to size, put the sheets into a copy machine like regular paper, then just peeled off the back and applied it to the wood. It worked like a wonder– thus the name Wonderpaper. 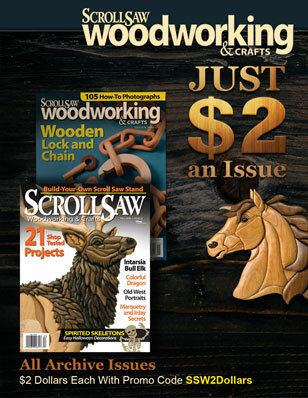 A single ad in Scroll Saw Woodworking & Crafts Magazine generated an international base of more than 200 customers for the new business. “It took a long time to come up with something that would work for Jason, because Erik’s needs were so demanding. But Jason is an angel and has always been so good about waiting,” Jim mused. “The paper worked out great for Erik, and now Jason can help with a business too. Jason proudly weighs the sheets, puts them in the bags, and takes them to the post office. He tracks his sales on a world map. Because Erik cannot be left unattended, Jim enlisted the help of personal assisstants for Erik and Jason, to help with their day-to-day activities, including their respective businesses. Although no one can predict what lies ahead, Jim is very hopeful for the futures of his sons and the businesses. Whatever the future holds, Jim says one thing is certain–they’re in it together. Erik Originals was created by Jim Warren to help develop the artistic talents of his son. Erik’s artwork includes sports, spiritual, and nature designs. Visitors to his website can view the gallery of his work and watch a video highlighting Erik’s life, struggles, and accomplishments, as well as television news clips featuring Erik and his work. For more information on Erik Originals, call Jim Warren at 785-623-7470 or visit the website at www.erikoriginals.com. Wonderpaper by Jason is a company started by Jim Warren to help his son, Jason, with the goal of leading a productive life and earning a living. 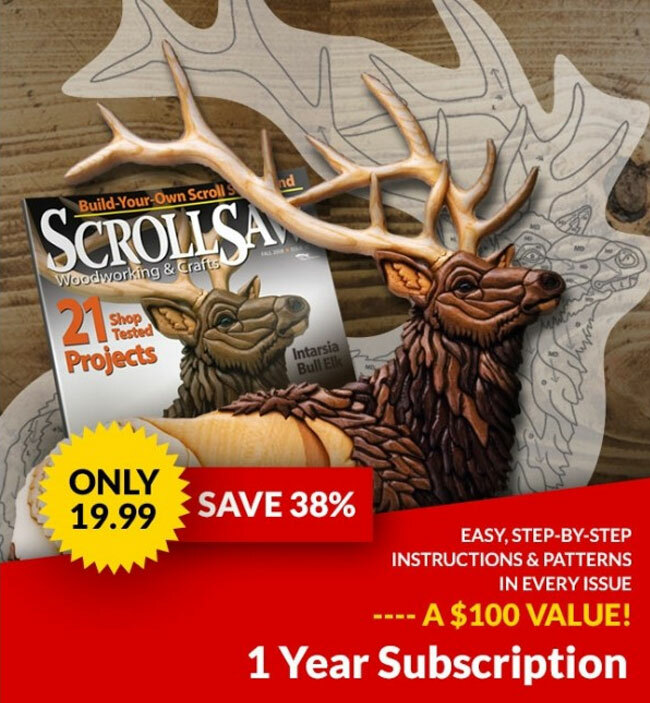 This self-sticking paper was initially designed for use in the production of scroll saw artwork, but has many other applications as well. Jim said the company plans to expand its line by adding several new products, including a clear Wonderpaper. To learn more about Wonderpaper or to place an order, call 785-639-7470 or visit www.wonderpaperbyJason.com.